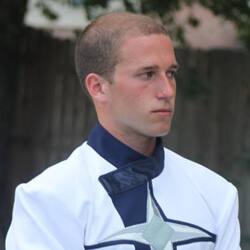 Mark Donahue, 21 Illinois State University Blue Stars, 4 years Baritone and Drum Major What do you think is important in choosing which corps to audition for? Choosing your corps is very similar to choosing a college to attend, and anyone who has been through that process knows you have to follow your gut. A corps could have the best credentials, but if it doesn't feel right, it probably isn't. When you have made the right choice, you'll feel excited to be with that group from the audition camp through the World Championships. How do you like to prepare for an audition? Practice, of course. But the week before, get outside your comfort zone and play your music for your parents, friends, little cousin and dog. The more you feel comfortable not only playing, but also performing for others, the more comfortable you'll be playing for some of the finest instructors in the world. What was your experience like the first time you auditioned for a corps? My first camp was overwhelming. It was amazing how much I learned in one weekend, but I felt like I could never perform at the level of some of the veteran members at the camp. I left feeling like I wouldn't get a contract and I'd have to try again next year, but two weeks later I got the call. What advice would you give to somebody who is nervous or unsure about auditioning? Definitely do it. If you're not nervous, you're not human. I can remember trembling for three hours in the car to my first camp. It turned out to be completely worth it. Any other tips? Don't forget to look around. It's really easy to be so concerned with the five-minute audition and forget about the other two days you'll be there. I remember on the last day of my first camp I finally listened, and it was amazing. I was standing in the horn arc and we were playing amazing music, and I had almost missed it worrying about the audition! Learn more about corps audition dates, locations and additional info.